Believers Eastern Church served a hot, nutritious meal to 150 men and women working in a brick factory on International Workers’ Day, May 1, to encourage and show God’s love. Pastor Aapt and the leader of the local Women’s Fellowship, Chadna, led the food distribution. Many of the people in this area serve as labourers in the factory. 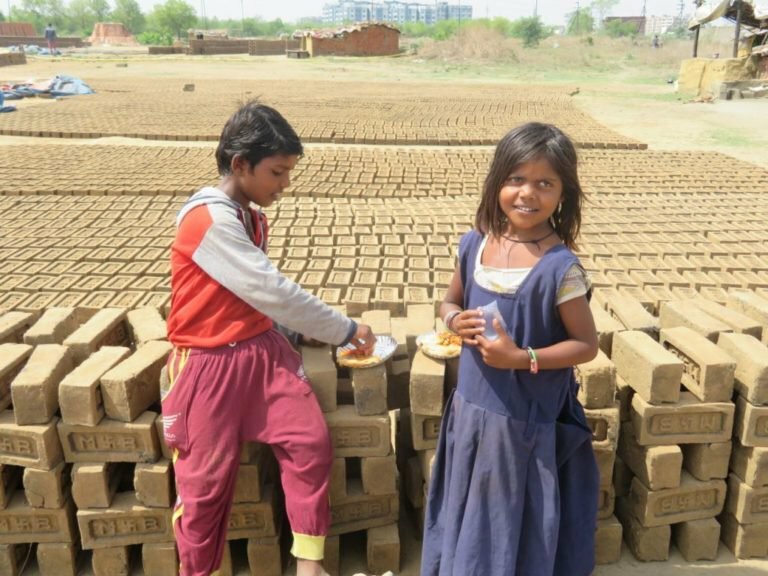 They are from all different cultures, making bricks. The program started at 9:00am with a word of prayer. Fateh, a brother in the Lord, and a team of Sisters of Compassion presented a special song, and the festivities began. The men and women listened keenly as they were commended for their work, which is something they do not often hear. Pastor Aapt was also able to share about God’s love with them. When the message was over, the team from Believers Eastern Church distributed food items, including tomato curry and flatbread, to the labourers and their children. Many of the labourers thanked the pastor and Women’s Fellowship for their concern for them. In addition to taking care of the physical needs of the people, the Women’s Fellowship also provided New Testaments for anyone who wanted a copy. Through the work of Believers Eastern Church, led by Dr. KP Yohannan, Christ’s love is being shown in practical ways.